Luckily this section of the North Stan is fed by snow melt that flows into the river before the upstream Spicer Reservoir. So, in a sense, this river acts like it is “free-flowing” in April and May. Flows from the reservoir are only released during the night in summer to generate hydropower so this river has a very short season when snow melt can be taken advantage of during the day. 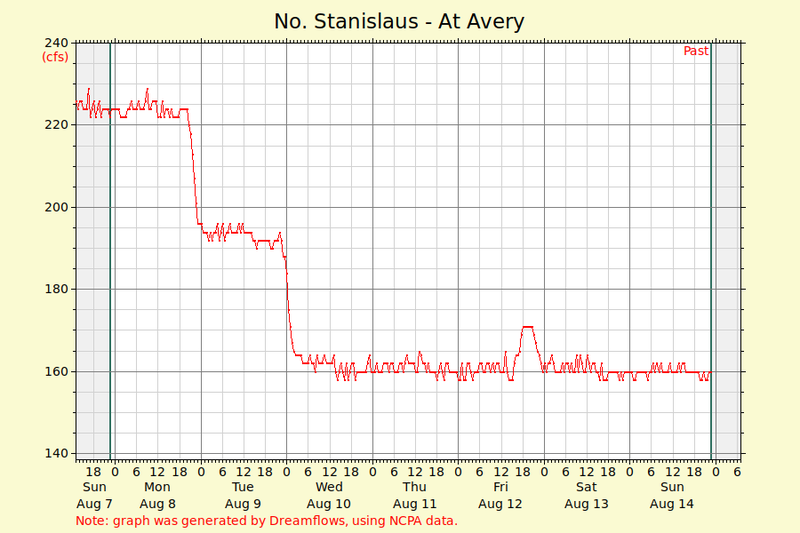 The North Stanislaus is an early springtime river and the raftable season is usually limited to just six weeks. 400 – 600 CFS = Medium flows. Very technical Class IV+ rafting through tight chutes, and over radical drops. At these flows the river resembles a trout stream at a high elevation complete with boulders, fallen trees and small pools. 600 – 1200 CFS = Medium-high flows. Less boulders and more drops. The river becomes more powerful and rapids increase in length. Plenty of Class IV+ whitewater. 1200 – 1800 CFS = High flows. Rapids become longer and more powerful. The obstacles change from boulders to stomping hydraulics and holes. Oar-paddle raft option may be available. 1800 – 3000 CFS = Extreme high flows. 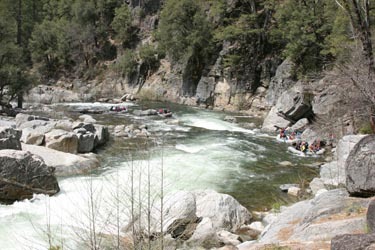 Rapids begin to “link” with one another and become very challenging. Calms between the rapids become shorter and some disappear. The rafting season is unfortunately quite short on the North Stan, sometimes limited to just a few weekends in May. But if you watch the snowpack (near Bear Valley) and the weather, and hit the river when it’s flowing well, you’re in for a real treat.